Complete waterproofing system for metal roofs that inhibits rust, stops leaks and provides an energy efficient, long-lasting and attractive finish coat for years of service. All seams are strengthened with fabric reinforcement embedded in our acrylic elastomeric (elastic property of rubber) roof coating. Exposed fasteners are sealed with acrylic caulking. Finally, the entire surface of the roof is protected with our industry-leading PUMA XL® Topcoat. The system is an effective method for preserving an existing metal roof without the need for costly metal repair or replacement. What if? 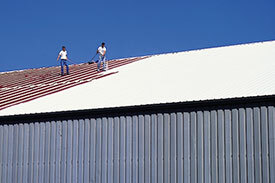 You could reset your metal roof to like new condition without removing the old roof structure and rebuilding a new one. What if? 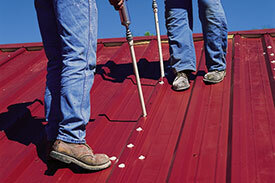 You could be done with looking for leaks, periodically retightening screws, and worrying about corrosion destroying your roof. What if? You could save enough on energy costs to pay for your "new" roof within the warranty period. What if? 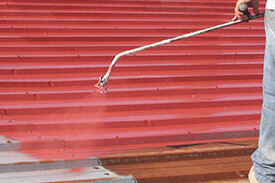 You could extend the life of your roof almost indefinitely by simple re-coatings. What if? You could improve the interior environment of your building by keeping creatures and content cooler in summer. With optional Polyurethane application, your metal roof can also be substantially warmer in winter. through a simple five-step process. Step 1: Power wash and clean with Rust Off®. Step 2: Prime with Metal Ready® rust inhibiting metal primer. Step 3: Kwik Kaulk® all fastener heads. Step 4: Reinforce existing seams. 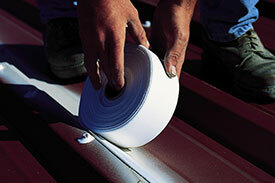 Step 5: Seal entire roof with an approved acrylic white reflective coating for durability and energy efficiency. Conklin Metal Roofing Systems are designed to provide better performance at equal or less cost of replacing your metal roof. 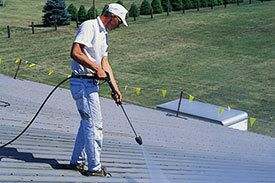 Additionally, there are financial benefits to metal roof restoration systems. Depending on your tax situation, roof restoration can be expensed as a repair or maintenance cost while roof replacement must be capitalized and depreciated over time. By using Conklin Energy Star labeled products on a roof, you can lower roof surface temperatures by 37 to 44 percent and decrease the amount of heat transferred into the building's interior, thus reducing cooling costs and reducing air pollution. A mailer arrived from Mast Roofing Inc. at a very convenient time. We were in the process of getting bids on roofing 4 buildings here in Bozeman. The total footage was 72,000 sq ft, a sizeable roofing job. We awarded Mast Roofing this sizeable project after examining several bids. Samuel and his brothers did a great job of sealing our metal roofs. The Masts were here on the exact date promised, completed the entire project within a two week period --- without any interruptions to our operations. The Mast brothers attitude was targeted at making Action Lighting a satisfied customer. We are totally pleased with Mast Roofing and recommend Mast without reservation to anyone reading this testimonial.